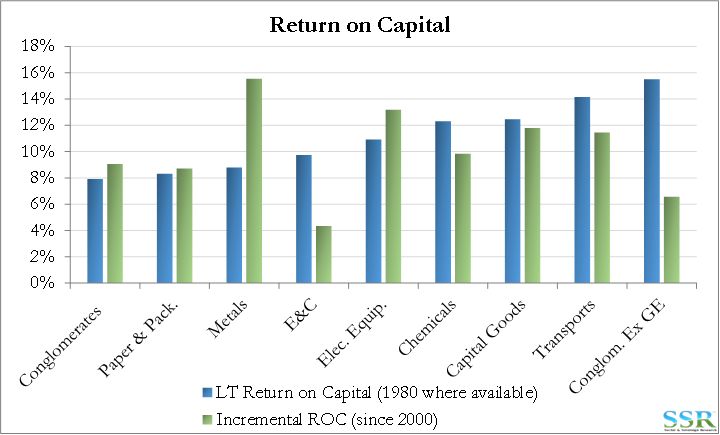 SSR LLC – Tr-Uncertainty and Br-Uncertainty: Whither Capital Spending? Capital spending for Industrials and Materials has already taken a step down in 2016 and we believe that estimates for 2017 are too high, as business uncertainty on both sides of the Atlantic should give corporations pause to assess changes in taxes, trade flows and growth. 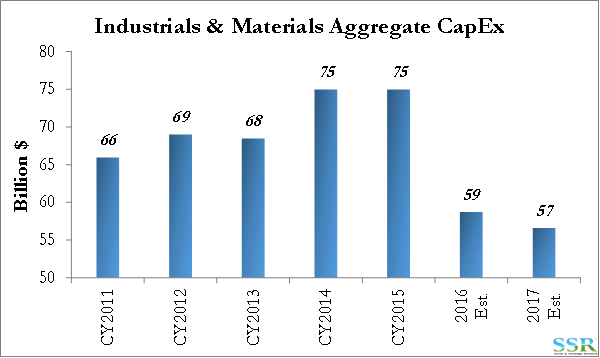 In aggregate, corporate earnings in the Industrials and Materials space are driven by putting increasing amounts of capital to work – hopefully at constant or improving returns. A slow-down in spending could result in a step down in EPS growth for some, although it may well be lost in possible gains from lower taxes and higher GDP growth. For others, any slowdown in spending may result in product shortages – good for pricing at the company level but bad for inflation – see accompanying piece on LYB. 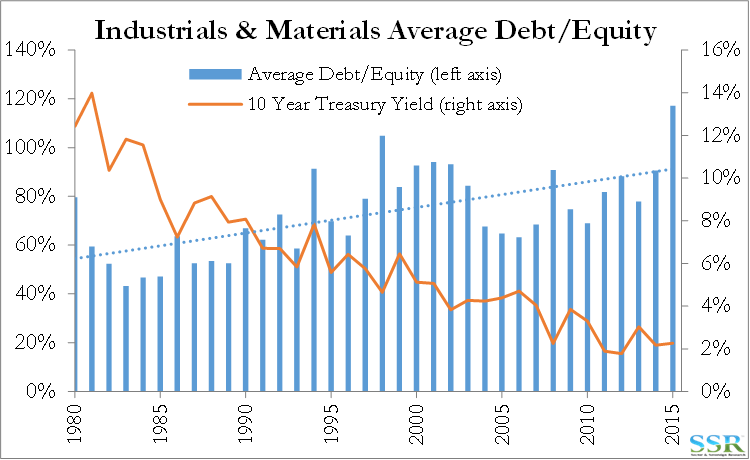 Rising interest rates (should they occur) may also slow growth as the sector has escalated its debt levels relative to revenues as rates have fallen since 1980 and we might expect debt paydown to become slightly more important should rates rise – perhaps at the expense of what have been very shareholder friendly dividend increases and buybacks. Everyone in the Ag space – assuming they have positive free cash. Commodity market tightening might be the bigger beneficiary of a capital spend slowdown, as a year of no, or lower, capital growth (even if the slowdown is only restricted to Europe and the US – or US and European based companies) would help bring some markets closer into balance and might make others quite short. Polyethylene is most interesting as installed capacity is closest to demand. A spending cut could result in tightness post 2018, especially if we see a US step up in demand growth – Aluminum could also surprise to the upside. For others products, we could see better pricing, but global surpluses are significant and it would be more a case of running up a cost curve rather than running short of material. After the Brexit vote we wrote that our greatest concern would be around corporate investment, particularly corporate investment that required key assumptions around relative tax rates, exchange rates and trade flows. The Trump victory does nothing but compound those concerns. Investors are chasing equities based on the assumptions that interest rates will rise and they are chasing some of the more obvious US sectors, such as defense and infrastructure. But we think the bigger question, particularly if we look beyond the next six months, is what will corporations do, particularly when it comes to investment? Before we even think about the likely new policies of the US and the UK, we have to recognize that these referendum/election results suggest a deep general unhappiness with the political status-quo on both sides of the Atlantic. With a failed reform referendum in Italy and consequent change of leadership and the “far right” party in France gaining ground, it would be naïve to assume that Europe is stable. There is a limit to how much of the European burden Germany will carry. While in our view unlikely, anything that the Trump administration does to throw more gasoline on the weaker bonds holding Europe together, just adds to concerns. Corporate taxes – how will the US look relative to the UK and Europe. If Trump allows repatriation of cash at low taxes but only if the money is used to invest in the US, then US companies considering capex overseas should pause, particularly if what they are considering would create far more shareholder value if built in the US with the repatriated tax support. Trade – we believe that at a minimum the Trump administration will be much harder on products coming from China that are priced in a predatory manner, or where it can clearly be demonstrated that they are being sold below the real cost of production. While perhaps co-incidental, China’s recent attempts to reflate its coal based economy by limiting production may in part be an attempt to address some of these issues in commodities. 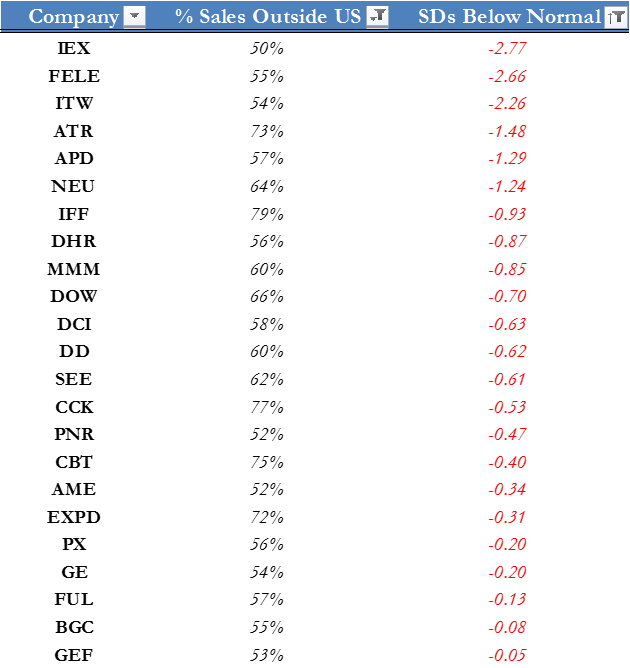 That said, the forward curve for Newcastle coal suggests that the market believes this to be a flash in the pan. But a general tearing up of trade agreements, which has been suggested by Trump, has much more far reaching effects as it would not only have an implication for product and product category pricing, but it would almost certainly have an inflationary impact in the US. It would and should impact capital spending decisions. Exchange rates: Higher inflation in the US will likely lead to higher interest rates and a stronger dollar – this hurts the US’s ability to export and lowers the value of overseas income. We have likely missed countless possible twists and turns in the bullet points above and each capital investment project would need to be evaluated or, now, re-evaluated based on the many possible macro outcomes, but the one conclusion that we keep coming back to is that the US and Europe, and possibly other regions, could see a minimum of a 6-12-month delay in some of the largest categories of capital spending. It is too soon to get too much evidence here but we are already aware of two projects in the US that have either been put on hold or where the planning process has slowed since the election. 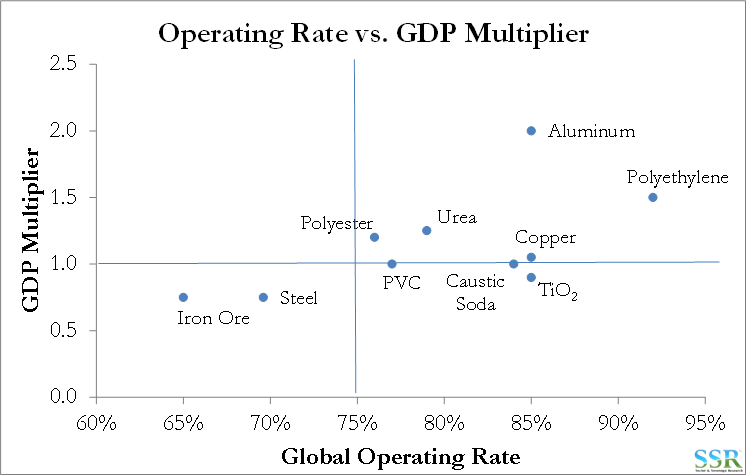 Ultimately, capital spending is a driver of growth for most Industrial and Material companies and aggregate capex for our coverage universe (companies over $5 billion market cap) for the last 5 years was shown in Exhibit 1, and we believe that estimates for 2017 are too high – by contrast estimates for 2018 may be too low. A list of companies included is attached in the appendix. 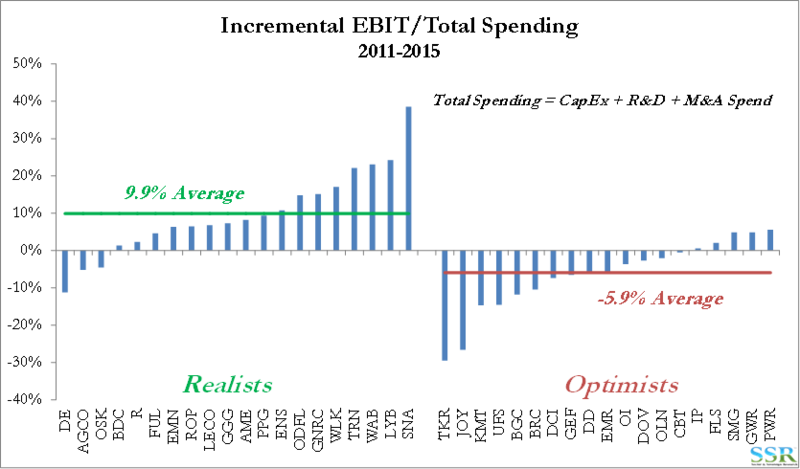 If we assume that we see a 12-month halt in spending decisions – 2018/2019 will likely see a 50% drop in new capital – in Exhibit 2 we show the historic average return on capital for each of our subsectors and suggest the drop in operating income growth that would come from a cutback in spending. 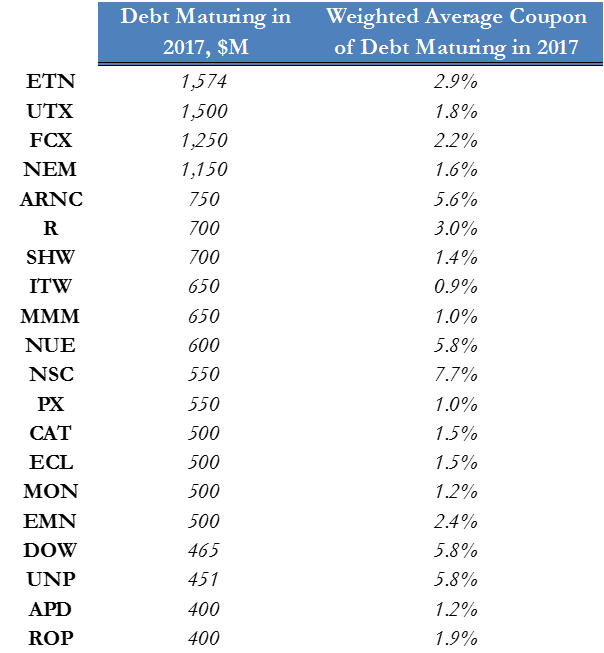 In Exhibit 3 we show companies with debt maturing in 2017, who given a pause in capital spending and the potential for higher rates going forward, might be tempted to reduce debt rather than refinance. 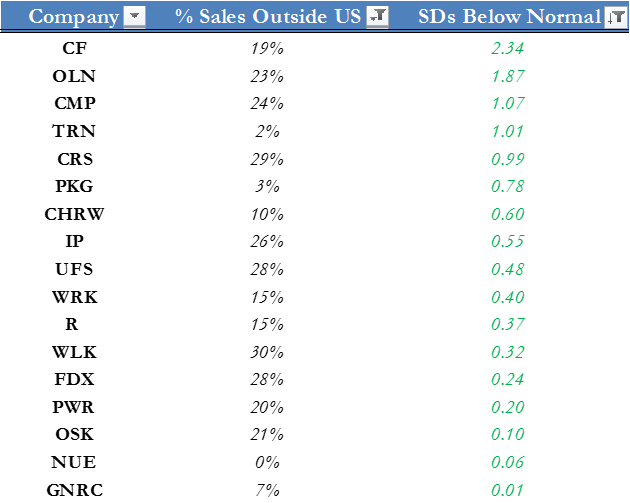 Exhibit 4 shows the stocks that screen well – looking at exposure and valuation, while Exhibit 5 looks at those that screen poorly on the same basis. There is a lot of very positive rhetoric around the likely pro-business policies of the Trump administration, not just from Trump himself, but also from corporates trying to encourage the better aspects of what is being discussed. However, we do not believe that the majority of companies will jump the gun. Optimism or overenthusiasm remains a major impediment to profitable growth and is a subject we have been writing about for the better part of 5 years – Exhibit 6 shows that optimists still exist and that they continue to underperform. We define optimistic companies as those who most consistently miss January 1st explicit or implicit guidance in any year over a period of several years – the group to the right in Exhibit 6 have been most adrift on earnings, overestimating. We have shown in prior research that the overly optimistic managements tend to over-spend and returns suffer as a result. However, companies can learn, and when they do it can make a significant difference – Dow Chemical was a serial optimist from the 1990s through 2010, resulting in our view in misallocation of capital and the evident declining returns. The focus and discipline at the company over the last three to four years has removed DOW from the optimist list and resulted in some very positive results and surprises. What are the conditions around repatriation of cash – (DOW/DD) have around $10bn of cash offshore, but if repatriation requires US spending, it is very unclear where money could be spent quickly or profitably. US taxes – there will be a lot of debate and pushback on a greatly reduced US corporate tax rate. Trade policy – would you build in the US if trade barriers will make it harder to export – or could revised trade rules encourage you to build where the demand resides. This might encourage one group of companies to invest in the US and another group to invest outside the US. The commodity spending boom, especially in China, over the last 10 years has resulted in significant product overhangs – in many cases for products that have very slow underlying growth absent a China infrastructure bubble which now appears to have burst. While capital spending has slowed meaningfully for all products, both inside China and in the rest of the world, there are plenty of plans to keep building and slow-downs would help bring markets back into balance at the margin. As shown in Exhibit 7, ethylene and aluminum are the most interesting, despite the “stockpile” stories on aluminum and the US capacity additions on ethylene. While the data in Exhibit 7 is drawn from many – likely inconsistent – sources, we believe that both the operating rate and growth data points are illustrative of how very different some of these markets are. US additions look high on a US basis, but not on a global basis as there is not much else happening in the 2017-2019 period. Some of the original US plans have slipped quite badly, and we would not expect those scheduled to start up in 2017 to all meet timing plans. “The next wave” in the US is slipping further, and we have seen evidence of recent pauses in planning post-election. Lower personal taxes in the US should increase consumer spending and a focus on infrastructure should improve ethylene demand growth at the margin. All of these arguments could be applied to aluminum, but we have an inventory wild card here that we do not have with ethylene. In the case of ethylene, we will likely see the market tighten progressively; for aluminum, it will probably be much more instantaneous. While tax reform and repatriation could dwarf interest rate effects, it is worth noting that the 35 year period of rate easing has encouraged companies to carry much more debt both in absolute terms and relative to equity (Exhibit 8), and while no-one is predicting a return to high enough rates of inflation to push rates back to the levels of the ’80s, expanding debt levels are unlikely to be a source of capital growth going forward.